Workplace and job-related injuries are as varied as people themselves. However, whether construction accidents, factory accidents or accidents resulting from workplace conflict or safety violations, certain types of accidents occur with frequency greater than others. The Ohio Bureau of Workers’ Compensation (BWC) claims data show that over 60% of Ohio’s lost-time injury claims in 2010 were caused by slips, trips, falls and overexertion. Nearly one-third (30%) of lost-time injury claims result from slips, trips and falls (not to be confused with the Steve Martin/John Candy movie “Planes, Trains and Automobiles”). They are largely associated with slipping on ice/snow, water/grease, defective flooring and tripping over objects. Such injuries at work can perhaps result in significant disability resulting in lost wages, the need for work restrictions and even permanent disability. Workplace injuries can greatly affect a worker’s ability to perform gainful employment and earn a living. They may also impair the ability to enjoy and perform even basic activities of daily living, whether on a temporary or permanent basis. 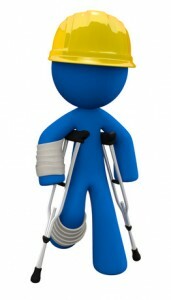 The Workers’ Compensation system compensates and provides medical benefits for such injuries. Overexertion is associated with over 30 percent of all lost-time injury claims according to the BWC. Such job-related injuries are typically related to lifting, pushing and pulling, bending and twisting, repetitive motions and awkward postures. 54% of lost-time injury claims resulting from overexertion are associated with lifting, pushing and pulling. Interestingly, professional truck drivers are at increased risk from developing carpal tunnel syndrome, not from overexertion but, rather, from steering wheel vibration that accompanies their long hours behind the wheel. A third category, according to one source, actually involves a hodgepodge of compensable injuries such as auto accidents and assaults while on the job (police and corrections officers are prone to these); becoming caught in or compressed by machinery; and being struck by objects. These can result in significant disability and ongoing impairment, even amputation or loss of use of body parts. Amputation and loss of use of body parts are compensable under the Ohio Workers’ Compensation system.